Junior doctors have voted to accept a proposal to end shifts lasting more than 24 hours. Junior doctors on the picket line earlier this month. 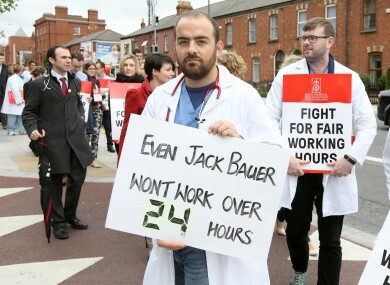 JUNIOR DOCTORS SAY they are trusting the HSE to keep its promise to end the dangerous practice of shifts lasting more than 24 hours for hospital doctors. Non-Consultant Hospital Doctors (NCHDs or ‘junior’ doctors) have voted to accept proposals aimed at settling the long-running dispute with the HSE over working hours. The plans will see an implementation of the European directive on working hours which will mean shifts will no longer last more than one day for hospital doctors. The Irish Medical Organisation said if the HSE doesn’t stick to the plan then it will be “back to square one”. The proposals will see IMO members working no longer than 24 hours in a row by the end of this month, spreading to all NCHDs by 14 January. Steve Tweed of the IMO said the change will make a “significant” difference in the lives of junior doctors. “Our members are certainly putting a lot of trust in the HSE to deliver this time – they have failed to deliver time and time again over the last ten years,” he told RTE Radio One’s Morning Ireland programme. “I think the key change this time is the accountability built into the agreement now and sanctions are built into the agreement”. If a hospital doesn’t implement the 24 hour maximum shift for NCHDs financial penalties will apply directly to the hospital. Tweed said that it was a unique industrial dispute as junior doctors stand to lose money with the implementation of the maximum working time as they will no longer be able to claim the levels of overtime or allowance that they have previously. “[It's about] a working and life balance which is more acceptable to the doctors and they’re prepared to accept the reductions in pay to have that balance,” said Tweed. Email “"We are putting our trust in the HSE" - junior doctors”. Feedback on “"We are putting our trust in the HSE" - junior doctors”.